Who Would You Add to Christianity Today’s 50 Women to Watch List? The October issue of Christianity Today highlights and celebrates women who are making a difference throughout the body of Christ in various channels of influence. I was thrilled to see friends and soon-to-be-friends on the list. I couldn’t help by cheer with Sara Groves whose music I’ve long adored, Ann Voskamp (when are we having that sleepover? ), Elisa Morgan who continues to lead leaders, Jo Ann Lyon who is a fearless leader among the Weslyans, Kara Powell whose research is changing the way teenagers are raised, and so many more. But I also can’t help but notice that any list like this has its limits, as noted by the editors of Christianity Today. These kinds of lists raise the questions of who should be included and who would you nominate. 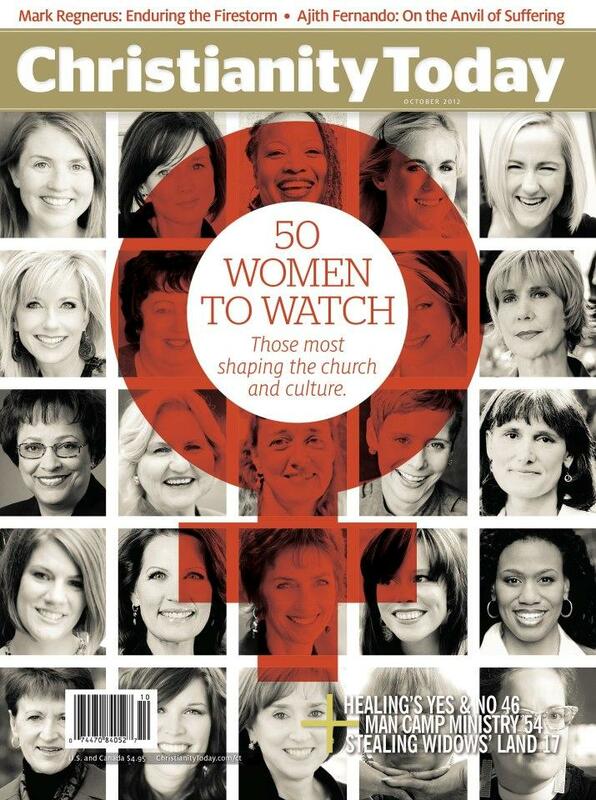 I know many more “Women to Watch” than any list like this could ever contain—I bet you do, too. I know women like Heather Zempel who is changing the way community life and small groups are done at National Community Church in Washington D.C. Women like Amena Brown who are carving out a unique place in the church as a spoken word artist. Women like Tammy Dunahoo who help lead the Foursquare Denomination. Women like Selma Wilson and Faith Whatley who are providing guidance in their roles at Lifeway. Women like Sheila Frost who are using their gifts to serve faithfully at a church outside of Charlotte, North Carolina. Women like Christa Flannery who are raising suburban’s full of kids to know and love Christ. Christianity Today’s list wasn’t meant to be complete—not without your name on it (if you’re a woman). But rather this list is an invitation to begin looking at the women all around who are passionately serving Jesus and using their gifts for His glory and be inspired to do the same. Will you join me? Oh, and who would you love to add to this list? To order your copy of Christianity Today’s “50 Women to Watch” and read more about each of these remarkable women, click here. How could I forget Cathleen (http://cathleenfalsani.com/)?! Incredible woman and great friend. Thanks, D.
all Amazing women who have helped me grow in my relationship with Christ and in my lofe for myself through their blogs! Rebecca, how could we forget Lauren, Ruthie, or Allison?? Thanks for adding them! Humbled & grateful to be included in such great company. Thanks, Jane. I heard you speak in Columbus, Ohio a few weeks ago and was powerfully moved by the message. In fact, you spoke on 1 John and the love of God…a sermon series I’ve been in for a few weeks at my church. I’ve got a ton of books on my reading list, but would love to get to one of yours. Which one do you recommend I read first? Congrats on the being in the top 50! Did someone say my name? (Love Google alerts for that sometimes.) I’m honored to be mentioned, D and sweet homeslice Margaret – and delighted to be mentioned in the same breath as Linda and Kathy, both of whom are longtime friends of mine and fellow Wheaton grads. (CT is decidedly NOT a fan of mine, so I was less than shocked not to be mentioned among the *mostly* august company of women.) proud of you, margaret, and so many others on that list. but since you asked … who did they miss? * my colleague Lisa Sharon Harper, who is the director of mobilizing at Sojourners and a force to be reckoned with/watched in the church and social justice movements. * and a young woman you’ve likely never heard of but i guarantee you – you will soon – named Sarah Johnston who is an exec at Amazon. WORLD-CHANGER. Kristin Chenoweth fully deserves her name on here. Totally agree. For sure thought Sarah Bessey would be on the list. Would also add Melissa Fitzpatrick (Beth Moore’s brilliant researcher and daughter) and Kelly Minter for uniting study of the Word with social justice. Sarah Bessey definitely deserves a spot on this list—awesome woman. Thanks for adding, Jenna. I would add Angela Thomas and Jenni Catron– two incredible women doing big things for the Kingdom. I adore Angela and Jenni. Angela Thomas has been such a voice of encouragement to me and I am cheering Jenni Catron on in her work, church, and family. These are some amazing ladies! what an awesome list, and congratulations to you, to be included! thanks for sharing it, i added some more books to my ever-growing wishlist!! My to-read list continues to grow, too! Thanks for your kind words, Megan. and (how could I forget?) Angela Thomas! I once sat on a plane next to a friend of Jan Silvious– looked her up afterwards and fully admire her work. Good addition, Brenda. I second Liz Curtis Higgs, if she doesn’t get you laughing coming AND going, I don’t know who else will! Those are great names to add. Huge fan of all of them and adore, adore, adore Angela Thomas! One blog that I’ve been loving lately is Good Women Project started by Lauren Dubinsky (http://goodwomenproject.com/). Communities like this are definitely shaping our culture through open discussion on difficult topics. I love seeing the variety of backgrounds and fields of experience of all the women on the list, plus the other ones mentioned here! Thanks for the great suggestion and link! I love learning about sites like this. And agreed–looking at the variety of backgrounds and fields of experience really demonstrate God’s vastness and goodness. Great women….how could we forget Crystal Lewis~!!!! It’s not the singer, if that’s what you’re thinking. This is a COMPLETELY DIFFERENT Crystal Lewis. For starters, the one I’m talking about is African-American. Be sure to put Michelle Borquez Thornton on your “Women to Watch” list. She’s a fresh GenX woman’s voice that is evangelical and offers authentic Christian solutions to a hurting world. She’s leading a team of women doing God Crazy conferences around the country starting this Spring. She’s also producing and hosting a divorce recovery DVD for women for Summer 2013. She’ll release several books in the next year from at least three different publishers. Keep an eye on her. “In 2005 Michelle Hosted and Co-Produced I-Life Television’s ‘SHINE With Michelle Borquez” and was the national spokesperson for Beth Moore’s “Loving Well” Television Ministry Special. She has authored several books to include “God Crazy – An Adventurous Road Trip to Joyful Surrender” released by Harvest House, 07 and “Overcoming the Seven Deadly Emotions” a guide to Emotional Healing released in 08. Michelle has hosted and been a featured guest on hundreds of television and radio programs, including The 700 Club, Midday Connection, Life Today with James and Betty Robinson, Postively Texas, TBN, just to name a few. A woman of vision, Michelle is also a business entrepreneur, ministry leader, international speaker, television and radio personality, and mother of four. She has worked as a leading business consultant for George Barna, John Maxwell’s INJOY, Bee Alive, American Association of Christian Counselors, Extraordinary Women, Family Restoration, and has assisted to achieve long term goals and objectives for major ministry leaders and church organizations. We were really impressed with her message and heart for God. That’s why we at Rose Publishing wanted to pick her up as one of the first authors in our new Aspire Press imprint. That’s a great shout out! Thank you! Myrna Brady – she’s served the Lord by serving others for years in various counselling roles. Recently, she has stepped out to launch her own Anger Management Counselling Service: AiMEd. I have absolute faith and excitement to see what the Lord is going to do with her willing hands, heart, and experience in this endeavor. Shyla, Ooohh–counselors make such a difference and we need them more than ever today. I have been blessed by counselors and seen my own life as well as many others transformed as a result. Thanks for highlighting her. Nancy Pearcey doesn’t seem to be on the list. Huge miss. Love Nancy Pearcey–brilliant thinker! And what about Barbara Brown Taylor! Love these precious women! I would have to add, Katie Davis http://kissesfromkatie.blogspot.com/, a 22 year old, mother of 13 precious daughters in Uganda. She is living out the Gospel in the trenches. I love reading Katie’s blog. Great person to add. I think Glennon Melton from http://momastery.com/blog/ is incredibly awesome. I heard Katie speak at a recent Catalyst conference. Incredible story! Thanks, Catherine. You should know about Lindsay Giambattista founder of Taylors Closet. Learn about her here http://taylorscloset.org/ She makes my top 50 for sure! I would add Nancy Leigh DeMoss, Kay Arthur and Janet Parshall, for sure! Those women have been doing amazing things for so many years. What inspirations! Lysa TerKeurst. I enjoyed your article. Most definitely, Lysa should be included. What a bold woman of God! Thanks, Cynthia. Shaunti Feldhahn should be on this list, for sure. I’m surprised Beth Moore is so far down on the list, too. Shaunti is a great person to add, Julie! The list isn’t in an particular order (other than grouped by what field each woman is in respectively–business, politics, writing, etc…). Two-time New York Times best-selling author & president of Proverbs 31 Ministries Lysa TerKeurst whose online ministry reaches over 600,000 women. SHOCKED she isn’t included! Karen– You’re so right! Lysa is an incredible woman of God and is doing HUGE things for his kingdom. Thanks for adding her. 1. Jena Nardella (blood:water mission)…. as a categorical addition: single moms living in major urban areas…..
Love the women you added– huge fan of JJ Heller’s music. I would also add Kristen Welch of We are that Family http://wearethatfamily.com/ and Mercy House http://www.mercyhousekenya.org/ She’s changing lives through a maternity home in Kenya. Suzanne, one of the girls in our office wanted Liz Curtis Higgs on there, too. She would also vote for Lamont, I’m sure! Hi That's very interesting. How do you do that word cloud thing or is that your trade secret? I'm a woman and I block David Quinn on twitter because I think he comes from a tradition of men speaking about how they would like to dictate women's rights that have had more than their fair share of attention in this country and I don't need to see his tweets retweeted either. Christianity Today’s 50 Women to Watch List? – Margaret Feinberg”? Also Alexis from RHOOC on Bravo! BBM assists you talk with Apple iphone and Android users. but it addresses a great deal of sporting actions. variations between your two, you can take a contact yourself. care of the situation, rather effectively. Next be sure the location in your body to your tattoo is chosen wisely. With bills growing up and constrained resources to pay for off them bankruptcy may seem attractive. Thanks for finally talking about > Who Would You Add to Christianity Today’s 50 Women to Watch List? List? – Margaret Feinberg < Loved it! Woah! That’s a massive list. Cheers! Lillian Daniels deserves to be on the list as well, as she is a fabulous preacher. For authors, Anne Lamott deserves to be on the list! I second the votes for Nadia Boltz Weber, Lisa Sharon Harper, and Liz Curtis Higgs!